Today’s post comes from Kate Meredith who created and recently posted the teacher and student Galaxy Zoo guides outlined here. Kate is a former middle school and high school teacher who considers herself a virtual person in the Sloan Digital Sky Survey database. She has been involved with pilot testing, writing and training teachers to use the database for the past twelve years. She is very excited about how the Galaxy Zoo Navigator tools can help teachers engage groups of students to use images from the SDSS in ways that are fun and accessible. Guides and help documents for getting started with Galaxy Zoo and the Galaxy Zoo Navigator are available now on ZooTeach. There is something for teachers and students. Teacher Guide to Galaxy Zoo and Navigator: Getting in and Getting Started gives teachers all the information they need to get ready to do activities in Galaxy Zoo and the Galaxy Zoo Navigator. Student Guide to the Galaxy Zoo provides students guidance for classifying in Galaxy Zoo. Student Guide to Navigator Graphing Tool details information available with Galaxy Zoo images and how to view that information using the graphing tool. Zookeeping: Examples From the Galaxy Zoo provides a detailed example of the classification questions that are part of Galaxy Zoo. Yesterday – or today depending on your timezone – Google featured the Zooniverse as part of their One Today app in the USA. This is a fantastic chance to spread to word about the Zooniverse and to give people the chance to donate directly to help make it better. You can also see us on Google’s amazing 12 Days of Giving website. Regardless of where you are in the world, we think that the best thing most of you can give us is your time. So we’ve created giving.zooniverse.org which you can use to tell the world (or your social network at least) that you’re giving some of your time to the Zooniverse this holiday season. Perhaps you can help spread some citizen science cheer – or just show off that you’re an awesome contributor to science online. Happy holidays, Merry Christmas, Nadolig Llawen – or whatever you say at this time of year! Have a drink on the Zooniverse this festive season. Last year we created a list of festive Zooniverse cocktails for the grown-ups amongst you. Here are a few more, courtesy of our very own Chris Lintott. This is a recipe passed onto me from the Mars Phoenix team, who were looking for two of its components – salt and ice – in the Martian arctic, a region not dissimilar to that explored by Planet 4 volunteers. It’s a nice twist on a classic margarita. Half the chillies and mix with the tequila. Allow to stand for the amount of time you can stand it, but at least a few hours. (The longer you leave it, the spicier the tequila). THROW THE CHILLIES OUT. 2 shots Scotch – I like a nice smokey Islay blend like Black Bottle. This is a perfect Rob Roy, but we’ve renamed this classic in honour of our planet with four stars, PH1b. The four liquid ingredients represent the four stars, so shake all of them together and serve in a Martini glass, adding the cherry to represent the planet. This cocktail is not to scale. Becky Smethurst, our new(isn) Galaxy Zoo PhD student in Oxford, loves rum, so this is in honour of her first term in the Zooniverse. As with spiral galaxies, the direction of stirring is essential. Put two ice cubes in a glass and stir in the sugar syrup and the bitters. Stir clockwise. Add 1 shot rum, with two more ice cubes, and stir anti clockwise. Add the rest of the rum, two more ice cubes, stir clockwise. Pour apple juice into the top and sip gently. In honour of Snapshot Serengeti, this was suggested by Zooniverse volunteer Emma Price. Pour each shot carefully into a glass, then shake cocoa powder on top in a suitably giraffey pattern. (Note this cocktail uses three of my four least favourite ingredients, so I haven’t tried it myself. Let me know how it goes). To make it a GitHub gimlet, add one single, solitary tear shed at our lost of Arfon and shake viciously. Seasons greetings everyone! Since you’ve been so good this year we have a very special present for you… a brand new project: Radio Galaxy Zoo. We need you to help us discover black holes. Earlier this year, Galaxy Zoo expanded to include the infrared. Now Radio Galaxy Zoo involves looking at galaxies in yet another light. This time we are asking you to match huge jets – seen in radio emission – to the supermassive black holes at the centre of the galaxy that produced them. 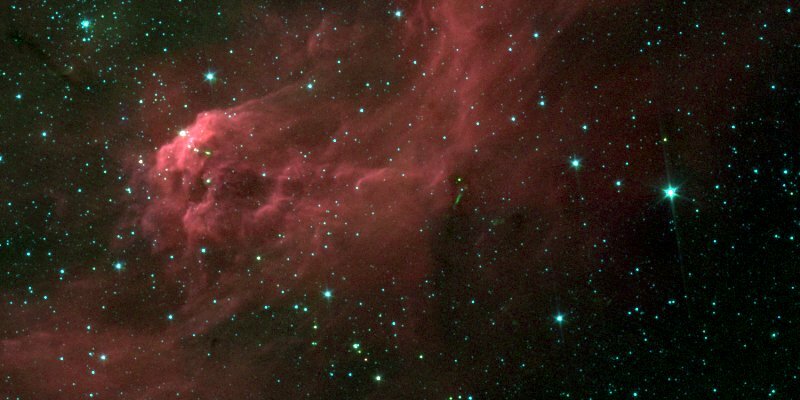 This requires looking at the galaxies in infrared and radio wavelengths. These galaxies are nothing like our own, and your classifications will allow scientists to understand the causes of these erupting black holes and how they affect the galaxy surrounding them. Get involved now at http://radio.galaxyzoo.org – and have fun discovering black holes in our Universe. 5:45 – Woke up. Decide to swap order of presentation. 7:00 – Breakfast, it is the most important meal of the day after all. 8:00 – Final presentation adjustments done. 8:45 – Public speaking makes me nervous sometimes so put on my favorite dress and purple tights for confidence. 9:30 – First session of the day – Effective Approaches for Addressing Next Generation Science Standards in the Earth and Space Science Classroom. This workshop was facilitated by members of the National Earth Science Teachers Association (NESTA) and began with an overview of how earth and space sciences fits in the NGSS. The presenters nicely summed up the NGSS Performance Expectations as – “involving a lot of action verbs.” Instead of statements beginning with “students will understand” or “students will identify” these new performance expectations begin with statements like “students who demonstrate understanding can develop and use a model to describe…” and “students who demonstrate understanding can analyze and interpret data to determine…”. The remainder of the workshop focused on Windows to the Universe, NESTA’s learner and educator portal. There are a variety of activities available for use in the classroom. There is a yearly subscription fee if you want to download and print PDFs but activities and worksheets can be printed for free from your browser. 11:00 – Second Session of the day – Making the Connection Between Formal and Informal Education. Staff from the Denver Museum of Nature & Science, the Denver Zoo, and Denver Public Schools overviewed two long-term collaborations running in the Denver metro area. Passport to Health is a bilingual school-year program targeting at 5th graders and their families. Through classes and events in school and at the museum, over 3,000 participants receive tools and knowledge promoting healthy living. Urban Advantage Denver , the second program highlighted, is an in-depth collaboration between local school districts and the City of Denver’s scientific cultural institutions. This program aims to empower every 7th grade student to think and explore like a scientist. 12:30 – Time to present. A small but enthusiastic group of 15 came to learn about a variety of Zooniverse projects and the educational resources available to bring them into the classroom. Sadly the internet decided to be uncooperative, but luckily I had a back-up plan and plenty of screen shots. There were lots of great questions and contact details exchanged. I can’t say much more because I tend to suffer from “post-presenting amnesia”, but it was a great session. 2:00 – Stroll around the second half of the exhibition hall successfully found candy to temporarily relieve my hunger rage. It was great to see the Crow Canyon Archaeological Center and Cornell Lab of Ornithology promoting their excellent programs. Totally have science education crushes on those two. 3:00 – Starving. Back at the hotel waiting for delivery while catching up on email. It was a great meeting, but it will be nice to be back home in Chicago. ‘Til next time NSTA! 5:45 – Up and atom (sorry, I can’t resist a good Simpsons reference). To the hotel gym for a little wake-up exercise. Criminey, altitude does make exercise harder. 7:00 – Caffeinating and fueling up for a day of science education. Mmmm.. Oatmeal. 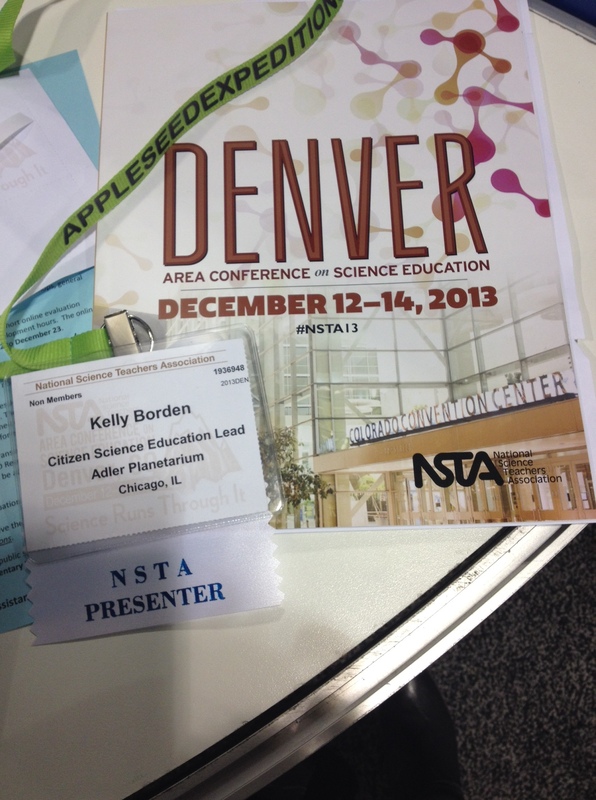 NSTA Denver- Science Runs Through It! 8:00 am – First session of the day! Understanding the Vision for Science Education from the NRC Framework and the Next Generation Science Standards from Brett Moulding. My takeaway from this was the idea of a “science performance”. Just as students showcase the skills they practice in music class at a concert or a performance, so must students with science. Students need opportunities to try out what they’ve learned by applying them. 9:00 – Found a bench and an unoccupied outlet to catch-up on emails and work on another conference proposal. 10:30 – Random conversation with fellow conference goers about inflatable planetarium domes. Evoked horrifying flash back of nearly being trampled by preschoolers trying to get to the front of the dome to see Elmo at outreach event several years ago. 11:30 – Strolled through first half of the exhibit hall. Nearly gave in and bought an I Heart Science t-shirt. 12:00 – Conference going is hard work, grabbed a bento box to fuel more science education networking! 12:30 Second session of the day – STEM! How to Create Rigorous, Authentic Learning for All. An overview of the transformation of Preston Middle School in Colorado into a STEM-centered school. The stand-out point was the importance of engaging faculty in STEM. Specifically, when creating a STEM-focused school, build around the passion of the teachers. Their enthusiasm and passion will draw students in. 1:35 – Realization that in fact I didn’t finish my slides for tomorrow’s presentation. 2:00 – Third and final session of my day – Building Collaborative Partnerships to Advance K-12 STEM Education. A panel discussion of creating collaborations to strengthen STEM educational initiatives. My biggest take away from this session was learning about the National Girls Collaborative Project . 3:30 – Search for afternoon coffee (thanks 7-11). 4:00 – Slides, slides, slides. 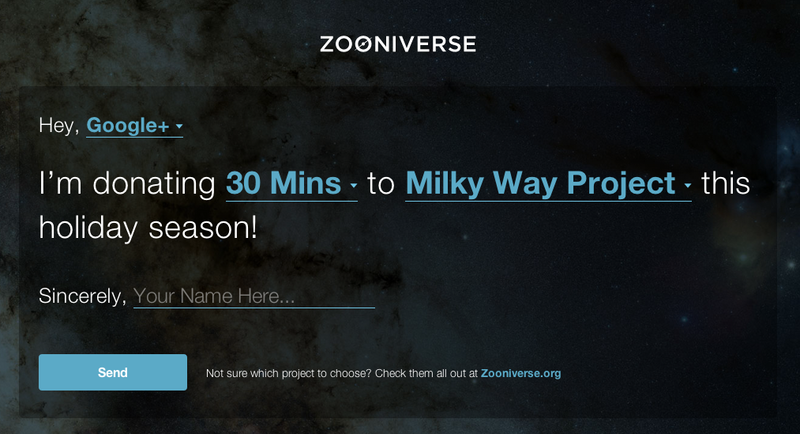 Put together the last portion of tomorrow’s presentation – Bringing the Zooniverse into the Classroom. 6:00 – A dinner of subpar Mexican food. Perfectly good guacamole ruined by olives. 7:00- Slides done, now to blog. Google confirms that the Zooniverse is awesome! It means a lot to us at the Zooniverse to have been given this award and we could not have managed it without you, our volunteers. The time and effort you dedicate to our projects shows the world how important citizen science can be, and we’re looking forward to the next few years. So thanks to you, and thanks to Google! PS: Just to be clear, this is a philanthropic act from Google – we’ll continue to be an academic project run by the team at Oxford, Adler Planetarium and elsewhere and all your data remains with the Zooniverse as before. Nothing changes, except our ability to scale! Hey everyone, for today’s advent calendar Rob and I made this short video talking about the various ways in which you can take part in the Zooniverse, and the multiple means by which you can keep up-to-date with what we’re doing. It also serves as an introduction for me, the new Zooniverse community manager. It is a bit silly at points, and we did it in one take with no script, so apologies for the rough feel!